Marjorie Grace Simpson (née Reid) attended Croydon Primary School, Burwood Domestic Science School and gained Intermediate Certificate in 1939 aged 15 years. She then attended Remington Business College and trained as a Bookkeeping Machine operator on the latest technology. From 1940 to1943 she was a Bookkeeping Machine Operator at William Arnotts head office which she said was a very, very boring job. ‘One night whilst dyeing my hair, I decided to go nursing. I was influenced by a neighbouring family with three daughters, all of whom were nurses. On 17th March 1943 aged 18, I commenced a four-year training course at Western Suburbs Hospital, Croydon (demolished in 1995), a 150-bed hospital. Other states had a three-year training course and I was very annoyed about this as junior nurses were cheap labour for the hospitals. I was the first trainee to be provided with uniforms at no cost to myself. We had no tutors or special training school. It was on the job training with a high wastage rate of trainees. Officially we worked at 52 hour week but every day we worked unpaid overtime. Day shift commenced officially at 6 am but we had to report to the night sister at 5.50 am at the latest – most times we started at 5.30 am which was necessary to get through the workload. Some days we worked a broken shift from 6.00 am to 2.00 pm, 2.00 pm to 5.00 pm off duty and commencing again at 5.00 pm and working until 8 pm. Three months every year was spent on night shift from 8.00 pm to 6.00 am with no meal breaks. We worked 21 nights without a night off and then had six days off. Then back to 21 nights and a six-day break. It was very difficult to sleep in the day, and sometimes we had to get up in the day to attend lectures and even sit exams. In our third year we would be the only nurse on duty in a ward of 40 patients. We had dinner in the dining room at 7.30 pm before we went on duty and at midnight a junior nurse cooked egg and bacon for us and brought it to the ward but sometimes we didn’t have time to eat it. We had tea and toast at 6.00 am and then we left the ward. If we wanted breakfast we had to stay in uniform until 7.30 am breakfast. As a result the night staff never went to breakfast. Matron did hospital rounds at 11.00 am every day and everything had to be neat and tidy. Floors were swept by a domestic, but all other cleaning was done by junior nurses. Third and Fourth Year did dressings, medication, temperatures and pulses, urine testing etc. Despite the exploitation, I loved nursing. We worked as a team and helped each other so at the change of shift we all went off duty together. The patients were always appreciative of our care and would often give you a paper to read, fruit or sweets. For our final examinations we had one day of written examinations at the Great Hall, Sydney University and one day practical examinations at a hospital. 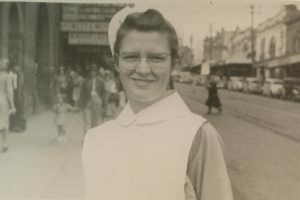 I commenced my midwifery training at Crown Street Women’s Hospital, Sydney in July 1947 and completed the nine month course in April 1948. I chose Crown Street as it was the first 200 bed hospital in NSW to have a ‘humidicrib’ in the premature babies’ nursery. It was also classed as an excellent teaching hospital. Babies were born in public hospitals with nurses and midwives. We had excellent lectures and were fortunate enough to have a very good tutor sister – Sister Love. Each student had to deliver 20 babies – this was done sometimes with up to 40 nurses and medical students watching. We had to witness 200 deliveries as part of our training. The course was very intensive and is now a 12-month course. We also did home deliveries of babies. Easter Saturday night at about 10.00 pm I was sent to a house at Mascot. I delivered the baby and stayed with the mother and four other children while the other nurse and the father walked to the nearest telephone fifteen minutes away. We had to report to Matron Shaw at the hospital about the condition of the mother. We left the mother and baby in a comfortable condition. We then walked to the nearest tram stop. It was about 2.00 am. We had a placenta wrapped up in a newspaper as we had to bring it back to the hospital for inspection. Matron Shaw was sitting up and waiting for us. We had only a few hours sleep as we were rostered for duty at 6.00 am. May 1948 I went to England and Scotland for two and a quarter years nursing in public hospitals at five different locations. This was a wonderful experience meeting nurses from Austria, Sweden, Denmark, Poland, South Africa and Ireland. The workload was less with adequate domestic staff on all wards and others available on requests. After working in such good conditions I could not work in Australian hospitals again. On my return I commenced my mother craft training at Vaucluse Tresillian, a four-month course. The setting was superb. We could bath babies and watch the large liners pass on their way up the harbour for an early morning docking. Once again we were overworked. However, I persevered as I needed this certificate to join the department of health as a Baby and Health Care sister. This work I loved. I rejoined the Baby Health Care Centres in 1964, working two days per week and I retired aged 65 years in 1991. It was a very rewarding job and I loved helping the mothers and babies. It was free service to all mothers in NSW. The centres were open 9.00 am til 5.00 pm five days a week. At the centres only one sister was in attendance though larger centres had two sisters. We were responsible for the health of babies under five years. We advised mothers on breastfeeding, diet and development. We acknowledge the Traditional Custodians of country throughout Australia and their continuing connection to land, waterways, culture and community. We pay our respects to Elders past, present and emerging. The Library acknowledges the support of the City of Sydney.